There's the old saw that the best way to teach kids to swim is to toss them into the deep end of the pool. While I may not agree with that theory (Hello…Red Cross swimming lessons??? ), the idea of learning by doing is a good one. 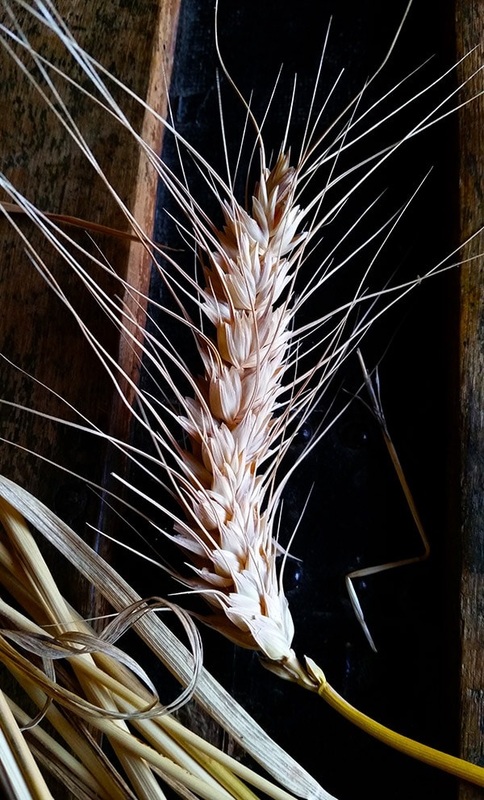 So when my friend, hunter, forager and author Hank Shaw, found wheat growing in his yard, he decided to see what it took to grow, harvest, thresh, winnow and grind his own flour. How little we consider the grains that sustain us. Tiny seeds that contain within them the power to change humanity, and by so doing render themselves almost invisible in their ubiquity. By the time The Gospel of John was written, somewhere around 70 AD, wheat, rice, barley, rye, millet, and, here in the Western Hemisphere, corn, had already dictated our existence for eight millennia. Grain, or more accurately dependence on grain, is what separated farmers from foragers, Jacob from Esau. Grains underpin civilization: portable, easily renewable, nutritionally dense foods that can be grown in surplus and stored—or kept from those the holder deems unworthy. Every culture that tamed a grain, although it could easily be argued that the grains tamed us, has held that grain sacred. In Japan, there is a saying that each grain of rice contains 88 souls, and to waste one is a sin. Similar proverbs exist all over the world. So how did grain fall from sacred to commonplace? To become something tossed about without thought, wasted, even scorned? I have been guilty of all of this. And chances are, so have you. I can distinctly remember times when I’ve thoughtlessly poured several cups of flour into a bowl to dust a piece or fish or schnitzel, then tossed the vast majority of it into the trash when I finished. It’s just flour, right? Well, yes. But then, one day, I decided to make flour. I started with acorn flour. Why? Well, I am a forager living in California. Here, the native people relied not on grain for their daily starch, but on flour made from acorns. California acorns have the decided advantage of being large — sometimes three inches long in the case of the Valley oak. And, again in the case of the Valley oak, these acorns can be low in tannins, and plentiful. Very plentiful. One old mother tree can drop a literal ton of acorns in a good year. Making flour from acorns requires that you leach out the tannins first. You do this by shelling the acorns, breaking them up into small bits and soaking them in multiple changes of water. It is a lengthy, but not difficult process. (If you are interested, here are my directions for making acorn flour) When your acorns are no longer bitter, you must then dry them and grind once more to get flour. When I did this, I became acutely aware of how much work this all was. 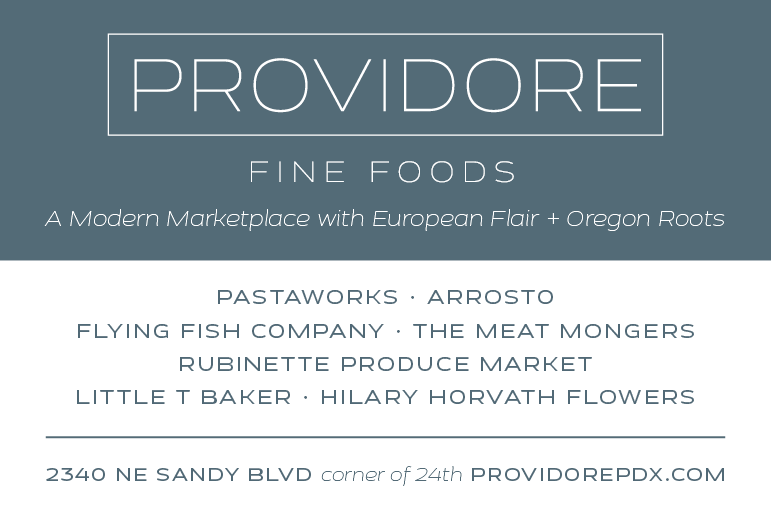 How precious this flour truly is. I do my best not to waste a teaspoonful. But acorns are not grains. 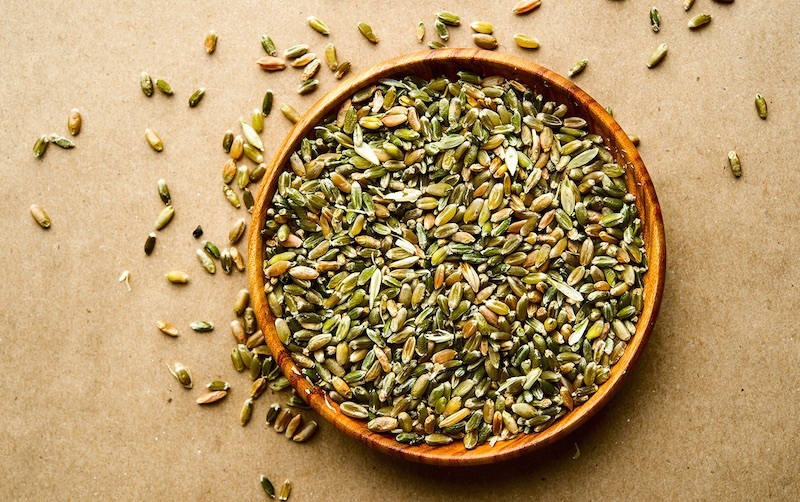 Grains, by definition, are the seeds from grasses. They offer a distinct advantage in that they are annual. If my village is dependent on a grove of oak trees, many of which may be a century old, and you come and burn down my oaks, my village starves. But I can hide a sack of grain seeds in a hole. And when marauders have burned everything and left, I can replant, and, in a year, rebuild. From one seed comes many grains of wheat. As it happens, I got a chance to see this first hand. No, marauders did not come to my house and burn down my oak trees. Rather, my yard became an impromptu wheat field. Holly [Heyser, Hank's partner in crime] bands doves for the state fish and wildlife department. To do so, she is given bags of mixed grain to bait them into a live trap, so she can capture the doves, band them and let them go. Apparently doves vastly prefer safflower to wheat, because when the rains came in October this past year, it was wheat that began to grow in our yard. Lots of it. I became determined to harvest this wheat. I had no idea what the yield might be, nor did I care. I wanted to see what it actually takes to harvest a grain of wheat. 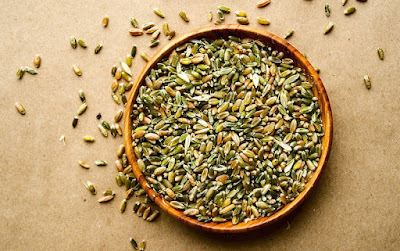 In late spring I began with green wheat, called freekeh or farik in North Africa. You harvest it when the grain heads are fully grown, but the plant still holds moisture; typically when it begins to yellow. 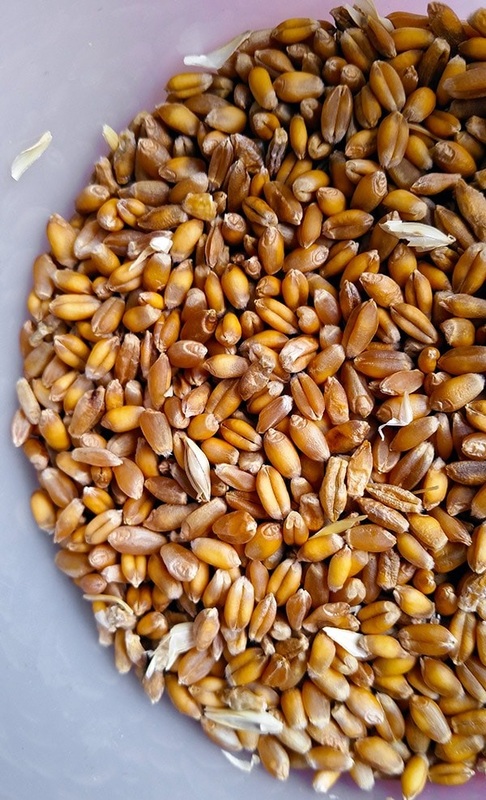 Now if you’ve seen a wheat grain head in all its glory, it is a beautiful sight. You can see why gatherers all those millennia ago would want them. 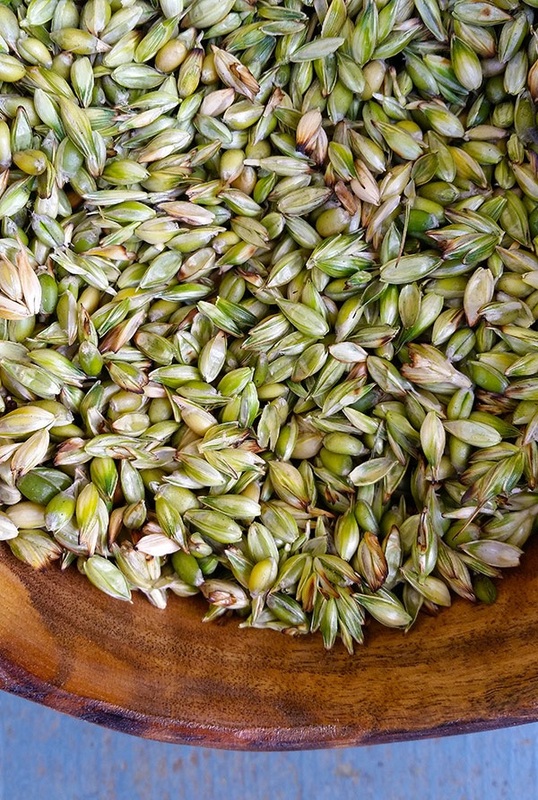 Large seeds (for a grass) that are, relatively speaking, easy to collect and remove. I gathered a mess of green wheat and set the sheaves on a steel plate. To make farik, you then set them on fire briefly to burn away the little spikes on the grain heads, and to parch the seeds a bit. You then let all this dry in the sun for a day or two, which makes it far easier to thresh and winnow your wheat—literally separating the wheat from the chaff. 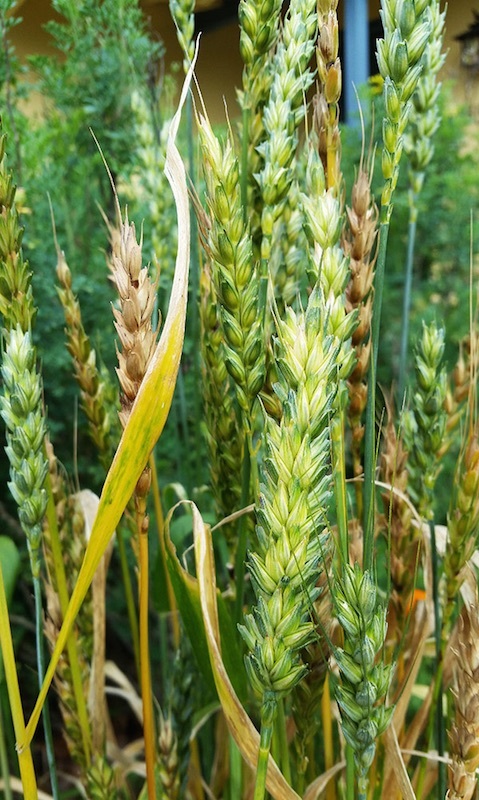 Read how Hank threshed his wheat. Read how Hank winnowed his wheat. And read one of the very practical reasons our ancestors may have ground their grains into flour. Top photo by Holly Heyser; the rest by Hank Shaw.